Hurricane Sandy is touching the base today in the evening. Throughout the East coast everyone has been told to evacuate homes and take shelter in somewhere safe. All the flights have been cancelled for the day. It's being claimed that Sandy is one of the most powerful superstorms no one alive today has witnessed. Sandy is expected to affect 60 million people bringing out unforeseen devastation including indefinite period of power outages, flooding and potential heavy wind damages. Sandy has already claimed 67 lives on its path across the Caribbean last week and now New York is bracing itself for the impending catastrophe. Some of my friends staying in New York have uploaded snaps, on Facebook, of deserted shelves in Wal-Mart, deserted streets in otherwise busy Manhattan, wooden planks being plastered on the glass panes of departmental stores, piles of sacks filled with sands heaped in front of the closed shutter of restaurants as precautionary measures to withstand the storm. Since yesterday here in Ohio, we could feel the wind blowing strongly than ever with the temperature suddenly dropping to a freezing degree. As I was out on practice driving along a narrow road yesterday, at 45 mph speed I could feel the gust of wind lashing against my car, I anchored my hands as firmly as possible upon the wheel to prevent the car swaying sideways. Throughout the time I was behind the wheel, I was on my toes while my hubby was quietly smiling beside me, enjoying my trepidation. So mean, truly. Back to the recipe, we all are familiar with Elish preparation with eggplant, but this one is an uncommon concoction of Tangra and Begun (eggplant in Bengali). I never had any idea before I tried this that Tangra could harmonize so tastefully with begun. 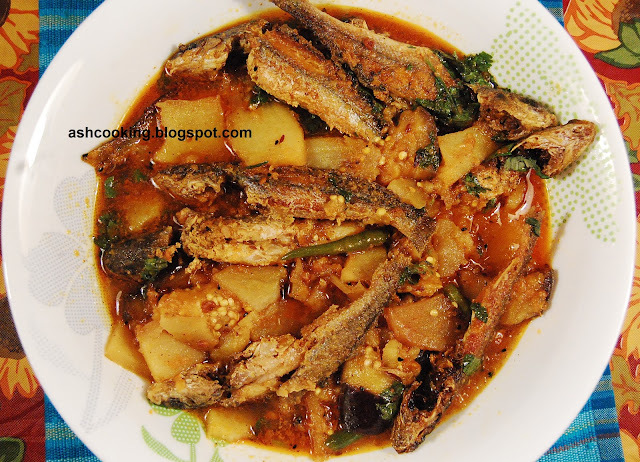 1) Toss the fishes in a sprinkling of turmeric powder and salt. Deep fry them till they turn brown in color. Keep aside. 2) Heat mustard oil in a wok. Add panchphoron when oil turns hot and allow it to crackle. 3) Add potato wedges and shallow fry. Toss in the eggplant. Stir around, shallow frying the eggplant. 4) Add salt, sugar, turmeric powder, dry red chilli powder, green chilli paste and tomato puree. Sauté the mixture for 2 minutes. 5) Measure out water into the wok for gravy and bring it to a boil. 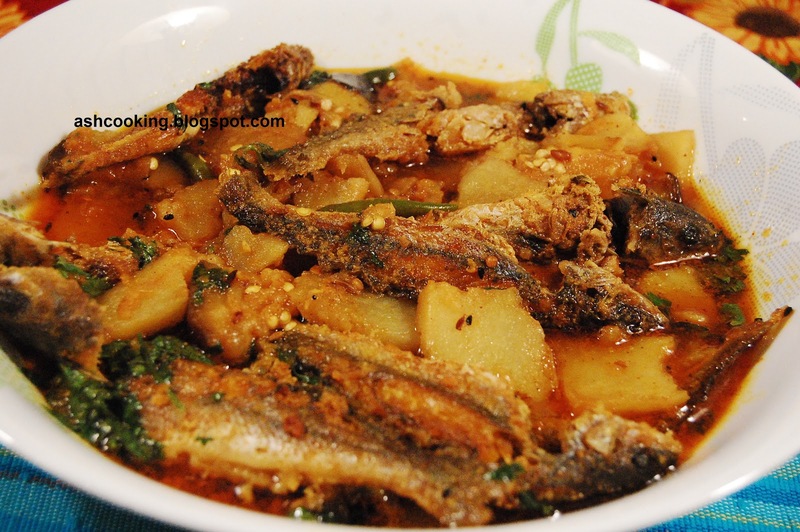 6) When potatoes and eggplants are both tender, slide in the fishes and simmer away the gravy for 2 minutes on medium heat. 7) Garnish with coriander leaves.